It did. A nice little shower. Better go check if anything in the gauge. A bit O.T.- but read that Darwin Airport may have experienced its warmest night on record last night, with a temp of 29.9°. Along with a DP of 26.1°, & RH 80%. Might be a bit of 'Mango Madness' around today with grumpy people and short fuses. Seems to be no steering at all so far today. A cell would need to build right on top of you to get any rain. To me I think it looks like the low off the coast is no closer than it was last night. Perhaps that is why we are seeing bugger all in the way of a widespread event. Might still be time if it gets a wriggle on. 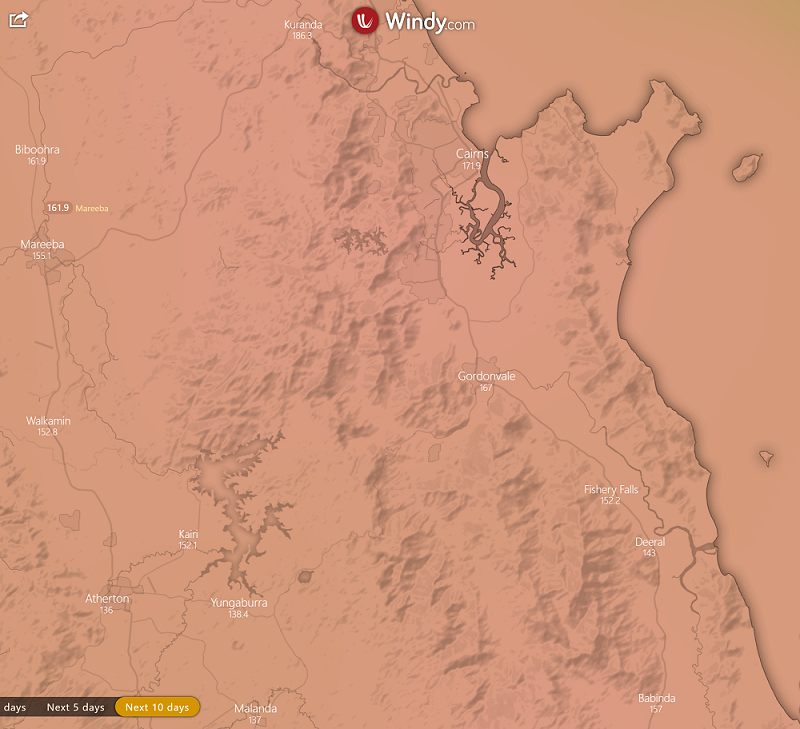 The WZ prognostic chart has the low staying to the east of 160°E from saturday onwards. Don't rule it out just yet Wandjina. I think we are still in with a chance. What would the feel like temp be? 1700 degrees???? Just checking out Windy. The last 24hrs they both EC and GFS have progged similar accumulated rainfall for my area. I see now they are poles apart. EC going for a bucketing and GFS just a standard bunch of showers. Just showing how difficult this system has been to forcast. Haven't bothered looking til now, in case I jinxed it. Half an hour later, still nothing. Not even the slightest change of temperature or even a breeze. A few decent showers coming through now. What a bummer looking at all that moderate to heavy rain on the radar, that just parallels the coast and keeps on going. 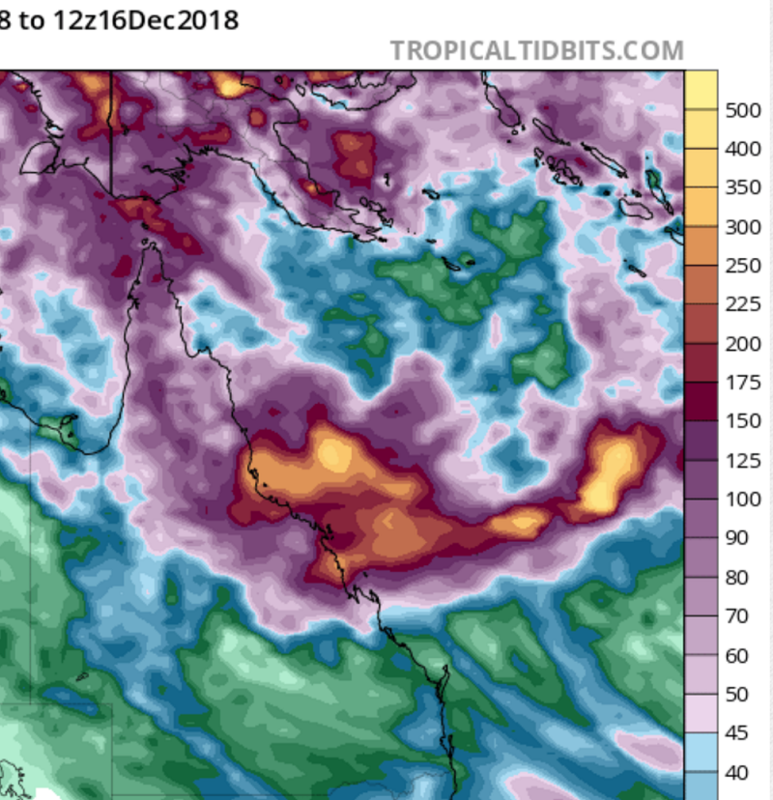 Some nice little showers over the last hour or so dropped 50mm in the gauge...shame to see so much moisture out in the Coral sea and so little over the coast..
Hopefully the Sou'easters will push a few showers ashore the next day or 2..
23mm overnight. The set up looks better this morning. The low looks as though it has shifted a bit further north. Wait and see I guess. Lolol, Wassat, Hickory? Did you say something? Oh Yeah, we got rain. 73mm in an horrendous night - not on the big scale of things but...restless adolescent staffy, zooming mossies through the billowing lace curtains serving for a door, yet too sticky to keep a sheet over (the other half never gets bitten, he's got me as a lure!). A humongous cane toad (fun when you're sleeping on the floor, well trying to) setting dog off. All power unplugged, hence fans and lights too. Come midnight I was sitting in my recliner reading an old LeCarre with a triangular led light perched on my chest illuminating the pages while those two snored away on the deck. Just woke up to a lovely peaceful morning with a faint hope that..
Perhaps partner will fog the mossies (the new machine I can't pull the starter hard enough to get it to catch despite it standing on a bench in a homemade bracket (old age, grrr). As I said, minor things in life, still an idyllic life! We have some good model alignment this morning in regards to the remnants of Owen. EC, GFS and CMC all moving him north and going with a crossing from about Innisfail to Caldwell Sunday night Monday. 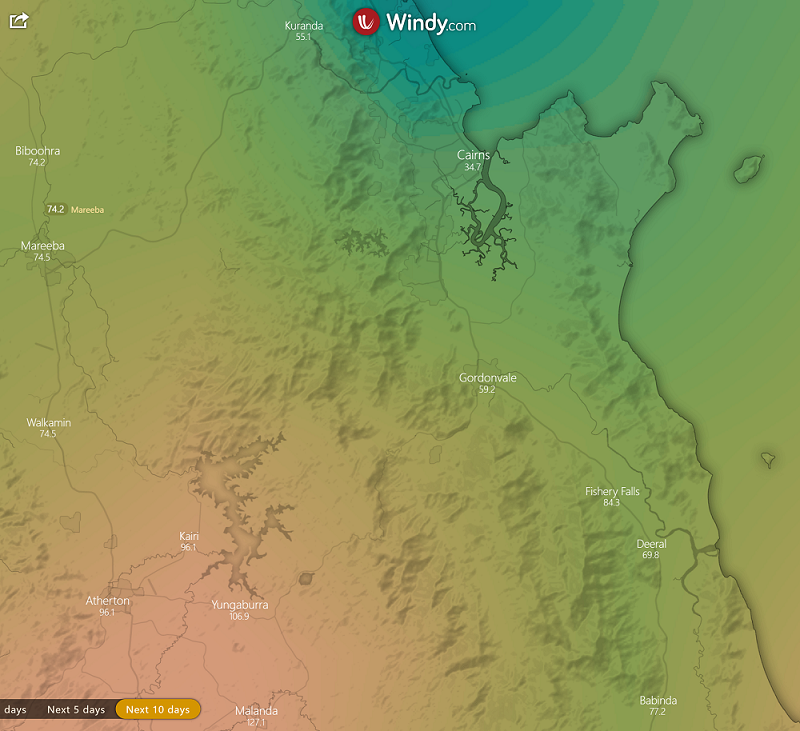 Access still has the low approaching Cairns then travelling SE parallel to the coast. Generated in 0.026 seconds in which 0.009 seconds were spent on a total of 14 queries. Zlib compression disabled.